I’m so exited to be writing this post. This Wednesday Mr. A could finally pick our little shelter cats up from the shelter that we abopted them from. It means that they have been with us for three whole days now. They are still really shy but I feel that they have made a lot of progress in such a short time. They have both taken candy from mine and Little Miss I hands, and they have started to show different personality traits. As far as I understand it she was found outside together with another cat. She was born sometime in June. She don’t trust people completely yet, which we knew when we chose her. But I knew as soon as I saw her picture that we had to give her another chance to of a good life. 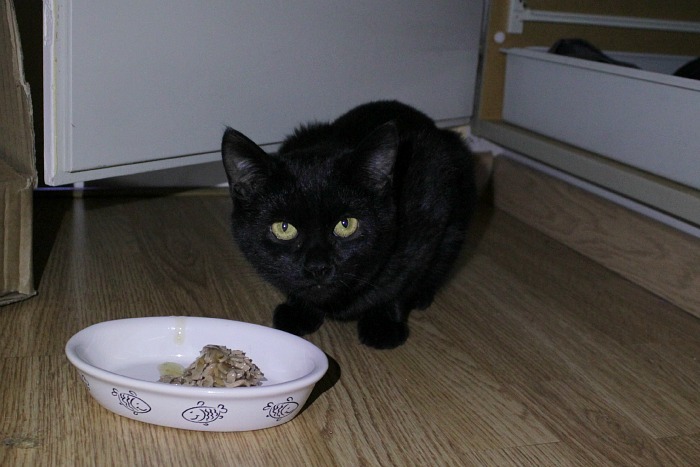 She was also found outside with her brother, a bit outside of Stockholm. She was born in May. She seemed kind of curious about us the first time we went to the shelter and since she is such a cutie she was the perfect choice. She is a little bit more carefull than Tee. 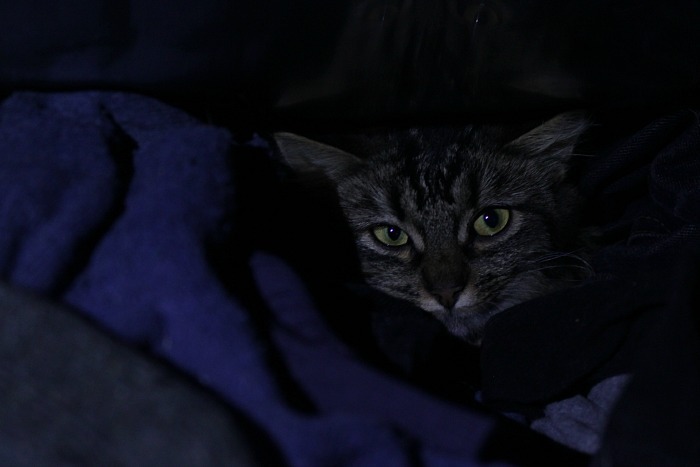 She seem to already have found herself a favorite sleeping spot among Mr. A:s woolen socks in the closet. Just as with Tee we can see that she is already getting used to both us and the apartment and that feels great. The girls accepted each other very well and I’m not surprised by that since they lived in the same room at the shelter. They started playing together yesterday, and they also share a plate when the best kind of food are served. Why we chose shelter cats. So why did we chose two cats that don’t really trust humans when we could have gotten two kittens for a way lover price? For us it wasn’t really a question. I think we knew that we wanted to have a cat from a shelter as soon as we started to talk about having a cat. And when we found out that if you wanted to adopt a cat younger than a year you had to adopt two, unless you already had another cat at home. So then the decision to adopt two cats was pretty simple too. And now when I know a bit more about both shelters and homeless cats I really know we made the right decision. Like many other shelters the place we gor our cats from has a ‘no kill’ policy, which means that no cat will get killed unless it’s suffering. But a shelter get full, and if no one would adopt their cats they can’t help new ones. And there are a lot of cats out there that needs their help. There lives 9 million people in Sweden. We’re not a very big country. But still we have over 100.000 homeless cats. And it makes me really sad to think about it. I think that there are so many cats out there, and not only in Sweden, that could have a wonderful home and be a great companion if only more people chose to adopt from a shelter. Sometimes they even have kittens. Please share this if you know someone that’s thinking about getting a cat. Or if you just, like me, that all the shelter cats deserves a second chance. Yay for shelter cats! There is an organization in my city that I donate to that helps stray kitties with a trap and release program. All three of my cats were adopted, and I have three strays (that have been fixed!) that come to my door to be fed.